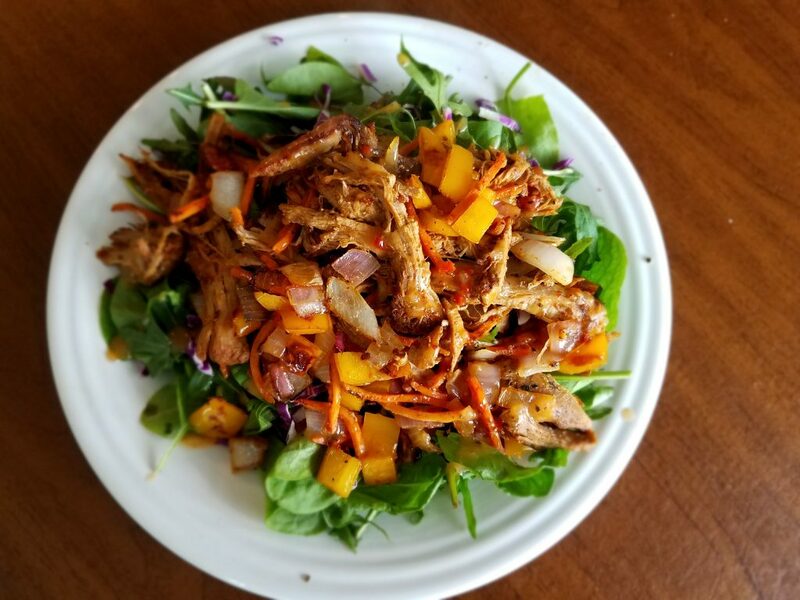 You won’t feel like you’re being cheated of anything with this easy, beautiful, and delicious salad made with lemony arugula, leftover pork, and sautéed veggies. I made this salad during the last week of my elimination diet. The cravings were becoming a little rough toward the end. Not sure if it was actual inspiration, or just pure hunger that helped me create this beauty. Sometimes you just need your veggies to look pretty to get you to eat them. 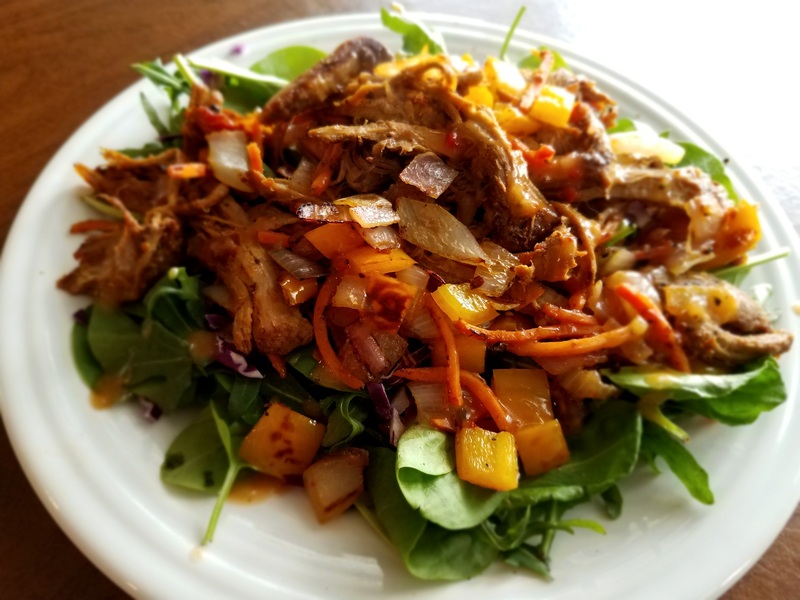 Earlier in the week I had made a large batch of Asian Oven-Roasted Pulled Pork, one of my favorite pork recipes. We ate it with coconut lime quinoa first, then this salad, then in lettuce tacos. It’s extremely versatile! 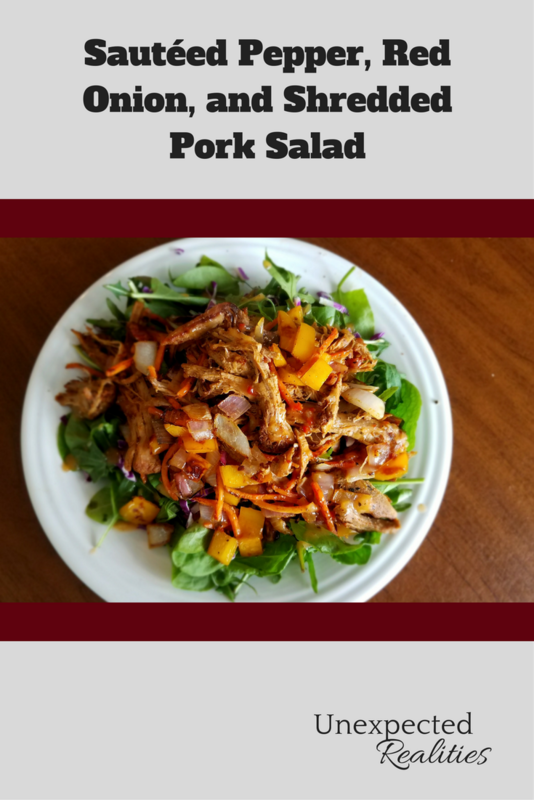 Once you have the shredded pork, this salad is easy and fast. Chop up some bell peppers and red onion and saute them in some olive oil with the shredded carrots. Season them with freshly grinded salt and pepper and garlic powder. When the veggies have softened, throw in the pork for a few more minutes to let the flavors meld together. Last but not least, plate the arugula and red cabbage, and place the pork and veggie mixture on top. Drizzle a little bit of italian dressing over it all, and congratulate yourself on making a ridiculously beautiful meal. 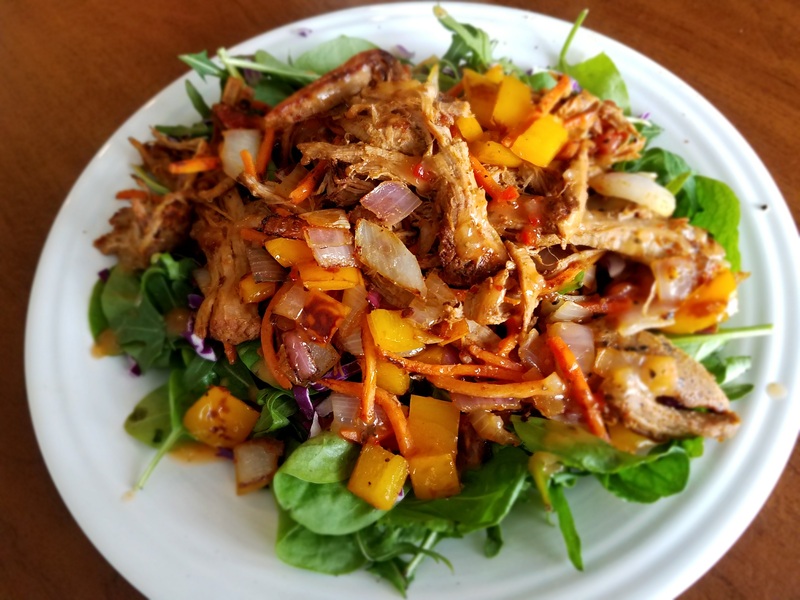 Use up your leftover shredded pork to make this easy and delicious salad, while getting in your daily intake of vegetables at the same time. Chop up the bell pepper and onion. Warm up a pan over medium heat and add some olive oil. Add in the peppers, onion, and carrots. Season veggies with salt and pepper and some garlic. Sauté for about 6 minutes, until the veggies begin to soften. While the veggies are cooking, lay your arugula on a plate. Grind some pepper over the top, and sprinkle on the purple cabbage. When the veggies have softened, add in the shredded pork. Mix the pork in with the veggies, and continue stirring often until the pork has become warm, about 3 - 5 minutes. Scoop the veggie and pork mixture over the arugula. Drizzle italian dressing over the top. 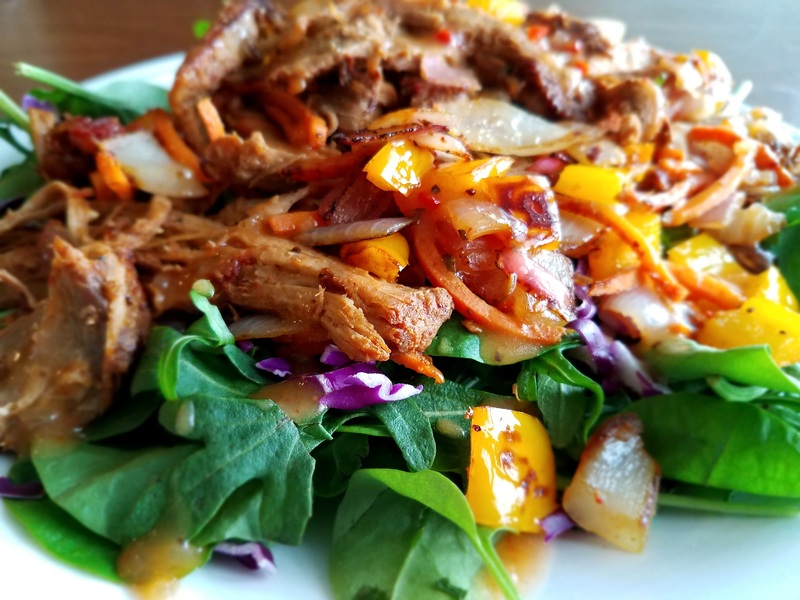 *My favorite shredded pork leftovers to use for this is Asian Oven-Roasted Pork. **I get the lemony arugula blend at Wegmans. ***My favorite dairy and gluten-free brand is Simply Balanced Organic Italian Dressing. I get it at Target. this sounds and looks delicious. I have actually never bought pork before!